Rose River Farm is well know though out the East for it's private water trophy trout fly fishing. 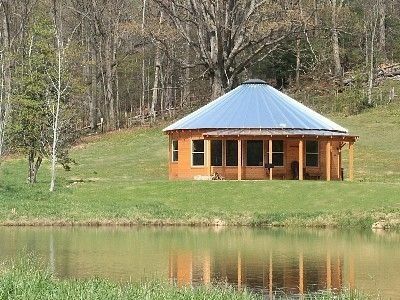 Fly fishing on our private water must be booked separately at the Rose River Farm website. This was a great place to stay with great views! The cabin had everything you could want. It was clean and well stocked! The furniture was top notch! We will be coming back! Great well needed Relaxing time! Very clean place. With beautiful scenery can’t wait to stay here again! The cabins at Rose River Farm were very nice and well done. Interesting design and very functional. The cabins were nicely decorated, well maintained and very clean. The main living area (living room/kitchen) was nicely decorated and very comfortable. There are 3 cabins that sit at the entrance to a farm. The cabin was well stocked with most necessities and about a 15 minute drive to a large supermarket. The only area for improvement is the checkout time. It is 10 am , which is early and made our departure morning rushed. Most places I have stay have a 11 or 12 checkout time. Overall, these cabins are a great option if staying in the area. So glad you had an enjoyable stay. While our checkout is at 10 AM our check in is at 2 PM as where many places do not let you check in until after 4 PM. Next time you visit if you would like a little later checkout let us know and we will do our best to accommodate you. Thank you for staying with us! The scenery is beautiful. The cabins are top notch, fully loaded. Most important, the environment is peaceful and calm. This was a great place to unplug for a day. If you like to experience the outdoors, to sit by the fire at night and you enjoy the peaceful exuberance of mother nature, this place is a no-brainer. I love these cabins and have stayed here multiple times. Very comfortable, great views, CLEAN, with great amenities if you want to grill or cook a full meal in the kitchen after a long day of hiking. Many awesome hikes with lots of wildlife viewing very nearby, and for the fly fisherman there are several close places to fish for beautiful brook trout in the mountain streams of Shenandoah National Park. We are located in the heart of the Virginia wine country and the Shenandoah National Park. We are also near many famous civil war battle fields. In fact, Stonewall Jackson camped on the site of the cabin on his way to the battle of Fredericksburg.